"In November 2006, I managed to herniate discs in my lower back by carrying too many heavy things at once. Dr. Gaffin and the staff at the Fairless Hills Health Center got me back on my feet in a few weeks. They also helped me with contacting my family doctor when I needed referrals and prescriptions for tests. I continue to go for routine adjustments and therapy. Wellness care is very important to me. The office hours are convenient and if I am feeling uncomfortable, I can call and get an appointment at a moments notice. Thank you so much!" Michelle M.
"Chiropractic care worked wonders on my migraines. I am no longer reliant on daily medications. The doctors and staff at the Fairless Hills Health Center are friendly, caring, and enthusiastic about their patients!" Suellen M.
"I wanted to write you to let you know how much coming for chiropractic care at the Fairless Hills Health Center has helped my 4 year old son. He has had a lot of problems with fluid build up in his ears. He was going to have his 3rd ear surgery; however, by bringing him on a regular treatment schedule, he has reduced the amount of fluid build up so greatly that he DOES NOT need to have the surgery done at this time." Amy K.
"My experience with chiropractic care at the Fairless Hills Health Center is that no matter what your age, it can make you feel limber, and able to be much more active. I have felt so much better with chiropractic care over the years and I am 80 years old. No matter how old you are, I feel it is important to continue with chiropractic treatment because it helps me get the most out of life by maintaining wellness!" Kathleen G.
"In July 2006, I twisted a certain way which caused me to experience soreness and stiffness in the lower back and sacral area after sitting. I went to my family doctor who prescribed medicine and physical therapy which did not help. I then consulted Dr. Gaffin at the Fairless Hills Health Center. He reviewed my x-rays and prescribed a chiropractic treatment program consisting of adjustments, traction, and massage therapy. After several months, my symptoms gradually decreased to the point where I am now able to sit for prolonged periods of time without experiencing discomfort in this area. I am most grateful to Dr. Gaffin and his caring staff for helping me recover from this injury." 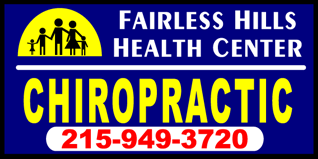 Diane S.
"I just want to thank the doctors and staff of the Fairless Hills Health Center for the exceptional chiropractic treatment and therapy that was given to me. I was suffering with very bad shoulder pain. My mobility was slowly decreasing. After not responding to medication, my family doctor sent me to an orthopedist, who then sent me for an M.R.I. of my shoulder. The orthopedist said I would probably be a candidate for surgery since I had a small tear of a tendon, but had no objections of me trying chiropractic care and therapy at Dr. Gaffin's office first. I received chiropractic adjustments to my neck, upper back, and shoulder, along with ultrasound treatment, massage, and trigger- point therapy to my shoulder. After 8 weeks of care, going about 3 times a week, I ended up with no pain and complete movement of my shoulder. I must say that it was a pleasure going to their office. Everyone was always friendly and happy, and I received wonderful care." Barbara F.
"I was very hesitant about going to a chiropractor, but I would like to say that I am very glad that I did. It has helped me tremendously! The doctors and staff at the Fairless Hills Health Center make you feel like family and answer all questions you have with respect and honesty. About 3 years ago, I had alot of trouble walking. Now, through my adjustments and therapy, I can walk longer and am pain free! I am so grateful I found the Fairless Hills Health Center through my doctor, who referred me to them. I feel like I have come alive! The office is very warm and inviting, and the office staff is so friendly and kind. I can't say enough about Dr. Gaffin. You will just have to try it for yourself and see what happens to your life. It will greatly improve your quality of life. A great big THANK YOU to the Fairless Hills Health Center!" Patti R.